My Domestic Monastery: Yes, Your Child Has "Special Needs." No, It's Not Your Fault. Yes, Your Child Has "Special Needs." No, It's Not Your Fault. This post has been ruminating for a long time. I haven't written it because my children don't really have special needs. I've done a lot of work with families and kids with real special needs - i.e. special needs that will last a lifetime, such as autism, cerebral palsy, Down syndrome, etc. But it occurred to me that some of you may be in my sort of boat. My girls both benefit from some help from a PT and a speech teacher. There isn't anything hugely wrong, but there's enough of something there that they need a little extra help at this stage in the game. Neither I nor their therapists anticipate this being a long term need, so I feel guilty saying my kids have any kind of "special needs." What I want to share with you are the top five tips I have for a parent who thinks their child may have some sort of special needs - even something minor and short term. I need to put in three disclaimers here. First of all, I do not think that every kid needs some sort of therapy. I DO think it's wise to make use of these resources if you think your child might need them. Secondly, I think that a lot of parents think that if their children don't have "real" special needs (i.e. something long term) that they shouldn't look into additional resources for their child. 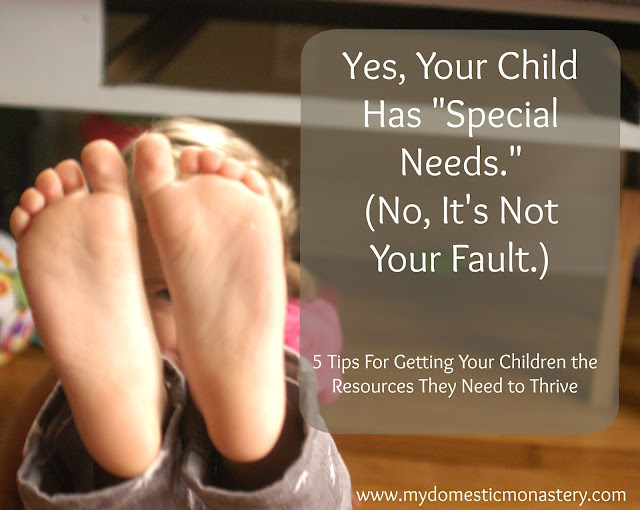 But there are some "special needs" that are short term (like my girls' challenges) and taking care of them while your children are young help them to thrive instead of growing increasingly frustrated. Thirdly, a HUGE hats off to parents whose children have more significant special needs. The past year has given me a teeny, tiny glimpse into your world, and I think you and your children are amazing for doing all you do. I am not trying to compare myself and my children to all of you! You are in a league of your own amazingness. All of our children have things about them that aren't perfect. It's part of living in a fallen world. We all have weaknesses, we all have aspects of our behavior/attitude we struggle with. Similarly, there are many kids who do have special challenges that they face at one point or another in life - delayed speech or gross motor, difficulty with fine motor skills, sensory integration issues, and even mental health issues. Most kids do not have these sorts of challenges, but many kids do. Be patient with yourself and your child. As any of us can attest to - it's frustrating to face a challenge. It can be empowering once you overcome that challenge, but I think we can all relate to the frustration you experience in the process. It's hard to learn new things, or to learn new ways to do things. It's frustrating to be the one in that place, but it can also be frustrating to be living with and parenting someone who is frustrated so much of the time. Be patient with yourself and with your child! Normally, childhood is full of challenges and frustrations. When your child has any sort of special need, they are facing even more challenges and frustrations, and so are you. So please, please, please be patient with yourself and your child. Let your therapist be your friend. As many of you know, I have long been considering homeschooling, and we are actually planning on doing hybrid homeschooling next year. Taking my child to a school on a regular basis was not what I had originally envisioned for her. I know that there are some homeschooling moms who don't trust teachers in public or private schools, but I'm here to tell you - you can trust them. I'm sure there are teachers and therapists you can't trust, but the vast majority of them genuinely care about you and your child and want to support you both in whatever way you can. Let your child's therapist or teacher be your friend! Talk to them about your concerns, ask them questions (even "dumb" ones), ask for suggestions, and just let them be a resource for you. The experience will be richer (and more fun!) for you and your child if you realize that your therapist is on your side. You are not weird or a bad parent. There are so many more resources available to parents than ever before. Would my children have survived if they lived 50 or 100 years ago? Yes, they would have. But I'm also sure that they would have had a lot more frustration in their lives in the process, and I'm also sure that there would have been things that they wouldn't have been able to do as well. If you're having to focus on learning to walk when you're almost two years old, it makes it hard to play with other children your age and it also takes up mental energy that you should be using to do other things. It limits your world. I'm not a weird or a bad parent for recognizing that. And my kid isn't weird or bad for having a challenge she's struggling with. In fact, it is healthy and normal to acknowledge when you need some extra help with something, and then to reach out and seek that help. I'm grateful for the opportunity to teach my children that lesson. It's hard to ask for help in any aspect of life, but the people who know how to do that are ultimately happier and healthier for it. Don't hesitate to get help. I had this misconception that because my daughters' "special needs" were so minor, it meant that they weren't real and I didn't need to seek help. My girls are both pretty bright, though, and were becoming increasingly frustrated with their inability to do what they wanted to do. Once we started looking in to program, I was surprised to find out how many children do need extra help at one point or another. 8-9% of children in the US need some extra help with their speech. That's a fairly large number! If your children have a need like this, they are certainly not alone or unusual. It's also important to know that the sooner you get your child the resources they need, the more they'll thrive. Don't hesitate to ask for help if you need it! I think that what I learned from this experience is that if you suspect your child might need a little extra help, don't be afraid to look into it. It might be that your child doesn't actually need the help you think he or she does - but they might. And if they do, you won't regret seeking it! The past (almost) year has been stressful at times, but seeing the progress that my daughters have made, seeing how much more confident and happy they are, makes it all worth it. They are thriving. This is a good post. I have known A LOT of children who fall into this category...they qualify for speech therapy or OT for a few years, and then they phase out of it and don't need the help anymore. My oldest was like this. When she was 4, she was diagnosed with global developmental delay and qualified for speech and occupational therapy. She had therapy through the local school district, while we continued to homeschoool for preschool, K and 1st grade. After 1st grade, she graduated out and didn't need it anymore and by 8, she was completely caught up with her peers and ha continued to stay on track (and even be advanced in some areas). I do wish we had sought help for her earlier,. She was my oldest and we weren't around a lot of other kids her age, so her delays weren't that obvious to us at the time....now as a more experienced mother, they would be very obvious. Plus, I was just scared at the thought of asking for help and getting "into the system" and all that. It wasn't bad and her therapists were all wonderful people and the school was very wlling to work with us and homeschooling and arrange therapy at a time that worked great for our schedule. This is such a great post and so well said Michelle! Our kids range from Mae with her definite long term special needs, to Sadie who needs short term therapies but will probably always struggle with her ADHD to Patch and James who their therapists constantly assure me "just need a little extra help" and I think that getting help early can be so beneficial, even with a slight delay. And I really think that early intervention can mean needing way less help later so I th it's great that you trusted yourself and reached out for help.